The 'average error' is the average difference between the aneroid barometer pressure minus the mercury barometer pressure. Most of my aneroid barometers are quite old and performance can be affected by the condition of the instrument as well as it's design. In general, I don't open or lubricate my barometers unless it is obvious that they are not working properly. It is not my intention to pass judgement on the design of the individual aneroid barometers. Take these results with a word of caution. ​My results are presented in the following table. The barometers are sorted from lowest standard deviation to highest standard deviation. The Belfort 6079 and the Yanagi 8A are at the top of the list. The Yanagi 8A is my favorite. The Belfort 6079 needs to be tapped before reading to free the pointer needle. The Yanagi needle is almost always at the correct pressure without tapping, perhaps due to its acceleration compensation. The Changchun DYM3 results were a surprise, in that this relatively inexpensive barometer performed quite well. The Utsuki Keiki barometer results were also a surprise in that the performance of this massive marine barometer wasn't that good. I need to recalibrate this barometer and perhaps lubricate it to see if the performance improves. A few of the barometers have rather large average errors. This is because I acquired these barometers in December and have not yet accurately calibrated them. There is, of course, error in the mercury barometer measurements. I did an evaluation of the accuracy of my mercury barometer, which may be found here. All of the measurements were made of the local pressure in my apartment, so that deviations from the outdoor pressure should not influence the results. The chart on the left indicates that the local pressure measured by the Belfort barometer is drifting down on average 0.33 mb per month compared to the mercury barometer. 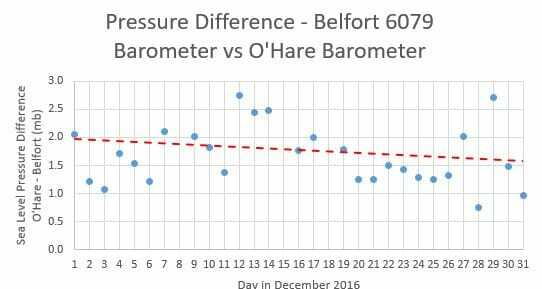 The chart on the right shows that Belfort pressure adjusted to sea level sea level is drifting down on average 0.40 mb per month compared to O'Hare Airport NWS data. For comparison, the mercury barometer pressure adjusted to sea level compared to O'Hare data drifted down only 0.071 mb per month, which is the difference in the value from the two charts. 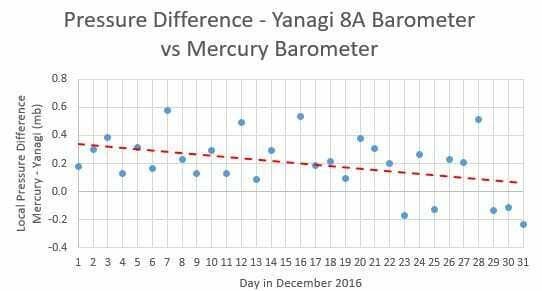 The chart on the left indicates that the local pressure measured by the Yanagi barometer is drifting down on average 0.29 mb per month compared to the mercury barometer. 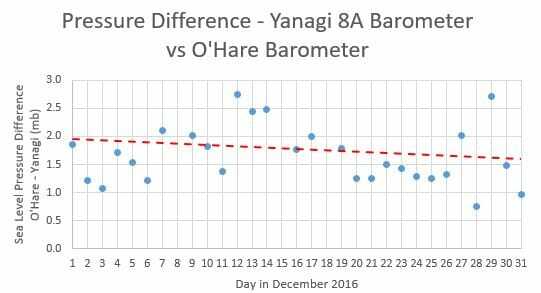 The chart on the right shows that Yanagi pressure adjusted to sea level sea level is drifting down on average 0.36 mb per month compared to O'Hare Airport NWS data. Again, the mercury barometer pressure adjusted to sea level compared to O'Hare data drifted down only 0.071 mb per month, which is the difference in the value from the two charts. I will repeat this analysis with January 2016 data to see if the trend holds up. Look for it in early February. I did recalibrate some of the aneroid barometers that needed it, but that shouldn't affect the drift rate.